In the second part of the series about Kamchatka, we will analyze the geothermal wonders of this amazing territory, Uzon Caldera and the Valley of the Geysers. Uzon is the biggest geothermal field in Kamchatka, 9×12 km in size and formed around 40.000 years ago. In this magical place we can find mud pools and cauldrons, thermal lakes and around 1.000 hot springs, mixed with the beautiful colors of the tundra, specially beautiful in the early autumn. This is also a fantastic place to analyze the extremophiles, micro-organisms living in extreme conditions due to the high temperatures and the acidity. Geologists, botanists, geochemists, microbiologists, zoologists and volcanologists find here a great laboratory where to investigate. One of the most unique characteristics of Uzon is the variety of minerals and different components (65 have been found so far), even a mineral called “Uzonite” not found anywhere on earth except here. The wildlife flourishes at Uzon, and several species call this place home. Some species of birds nest here alongside with the red foxes, deers, mooses and of course the majestic Kamchatka’s brown bears. The caldera belongs to the protected territory called Kronotsky Reserve, including the Valley of the Geysers and also the Kuril Lake in the southern part of the Peninsula. The easiest way to reach both places is by helicopter, allowing you to enjoy amazing aerial views of the volcanoes on the way to Kronotsky Reserve. One of the most beautiful and active volcanoes of Kamchatka is Karymsky, and its clearly visible young lava flows on the slopes. 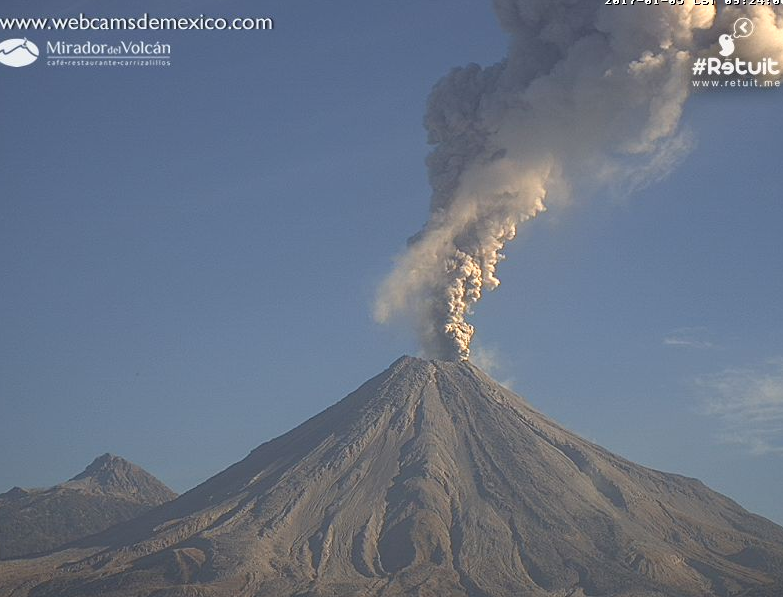 The eruptions of Karymsky usually consist of strombolian or vulcanian activity with lava flows from the summit crater with ash and gas emisions. Close to Karymsky volcano there is another volcanic caldera, Akademia Nauk, containing one of the biggest lakes in Kamchatka, the Karymsky Lake. This caldera, formed around 30.000 years ago, had its first recorded eruption in 1996, when a strange basaltic event occured in the northwestern part of the lake. And of course, Maly Semiachik and its beautiful crater lake characterized by the light blue colour. This lake was formed around 400 years ago after the eruption at Toitsky crater and the last recorded activity occured in 1952 with several explosive eruptions. The so-called Valley of Geysers, discovered in April 1941 by the crimean geologist Tatyana I. Ustinova is a natural wonder and one of the few places in the world with active geysers. This place has some special a different features: It’s the most compact geyser field in the world, covering only 4 square kilometres and unlike the other geyser areas in the world, it’s not a plateau but a beautiful canyon with several geysers on the slopes of the mountains. In 2007 a large landslide destroyed part of the area burying several thermal pools and geysers with mud, melting snow, trees, and boulders. It also blocked the Geyser River, causing a new thermal lake to pool upstream. The largest geysers in the Valley are “Grot” (Grotto) and “Velikan” (Giant), emitting up to 60 tons of boiling water. Despite this natural catastrophe, the Valley hasn’t lost its attraction and it’s still one of the most beautiful and unique places in Kamchatka. In the last article of the series about Kamchatka we will talk about the volcanoes of the southern plateau, including Gorely, Khodutka, Opala and the impressive Mutnovsky volcano. I’m organizing a trip to Kamchatka from 4th to 19th august 2017, visiting several volcanic areas focused on the most active volcanoes: Klyuchevskoy, Shiveluch, Mutnovsky, Gorely and also including a helicopter flight to the Kuril Lake. with a stop at Ksudach caldera. It will be a small group (max.10 people) and there are still 6 places available. Here you can find the itinerary of the trip. Thanks Roberto! Once again, stunning pictures. If anyone here gets chance to see a documentary called Wild Kamchatka (part 1) it’s well worth seeing and features this area including the landslide and with great views of Karymsky and other volcanoes in the region. Not forgetting the bears of course! On another note apparently there are reports of the alert level at Campi Flegrei being raised to yellow. Anyone know about this? Been second guessing the weather guys all day. They are tending to over alert today since they missed that short cycle spin up from yesterday that damaged some houses near here. I only knew about it because I was up all night (as normal ) and happened to be watching the doppler. As far as I can see, this was a newspaper today re-running the news from two weeks ago, about Campi Flegrei changing it gas emission, with the chance of an eruption in 5-10 year. So it is based on published research but nothing has changed since Christmas. thanks Roberto, I am considering the trip will I be completely a fish out of water if I only speak english, and is there an english version of the travel website? If this event is similar to what happened in the mid 90’s then we can expect several thousands of individual quakes over a period of years. So it could be the start of a new intrusive episode in the Hromundartindur system I take it? Isn’t this basically at or near the Hellisheiði geothermal power station? Could it be related (like the 2011 swarm)? It seems to be more related to the triple-junction slowly separating building up strain and the weak point being above the 1994 to 2004 buildup of a new magma reservoir under Hromundartindur Volcano. It will be interesting to see if there are noticeable changes in the GPS-trajectories in a couple of weeks. Could you kindly write to the administrators on the email that is found on the righthand upper side? a lot of green stars today. in peculiar for bard from the end of eruption it begins a lot. New fault forming? You be the judge. Wonder if that is from Lake Dellen in Sweden? And Mindat-org to the rescue. i. An extrusive rock between rhyolite and dacite in composition, and, broadly, the extrusive equivalent of granodiorite. iii. A rhyodacite from Dellen Lake, Sweden. Ahum. According to the tweet, the earthquake occured in 2102. Published in Science Advances – did science advance faster than time? (The real paper said 2012.) I will take this with caution, there are faults everywhere and not all become plate boundaries. Subduction boundaries can jump a bit (this is one way the continents grow – a little bit of the oceanic plate is plastered on to the continent) but this paper claims a new break under a different angle than the subduction zone. It seems over-interpretation. 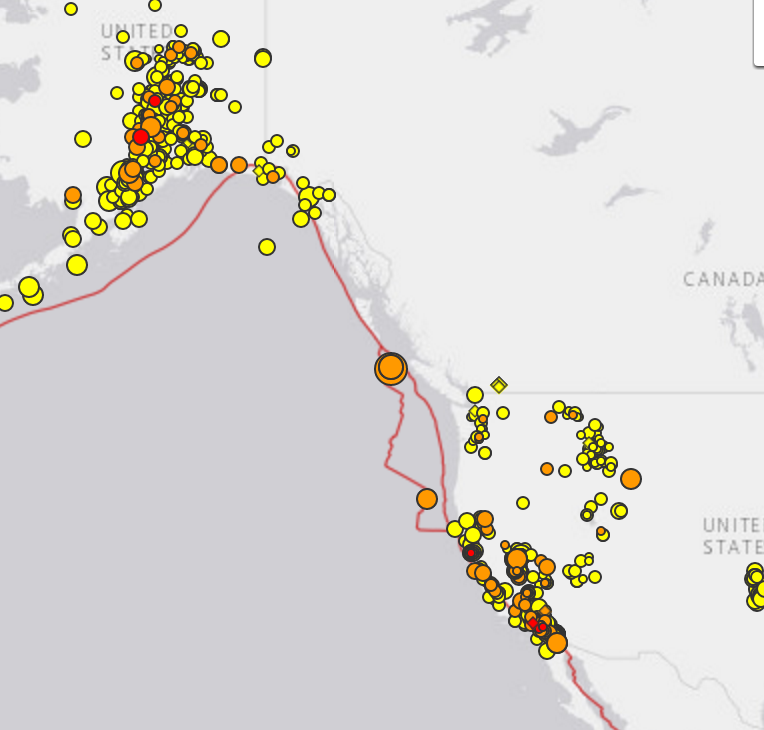 This is the earthquake map for the past week. But earthquakes in this area are very common. Which is actually encouraging. in the cold water. 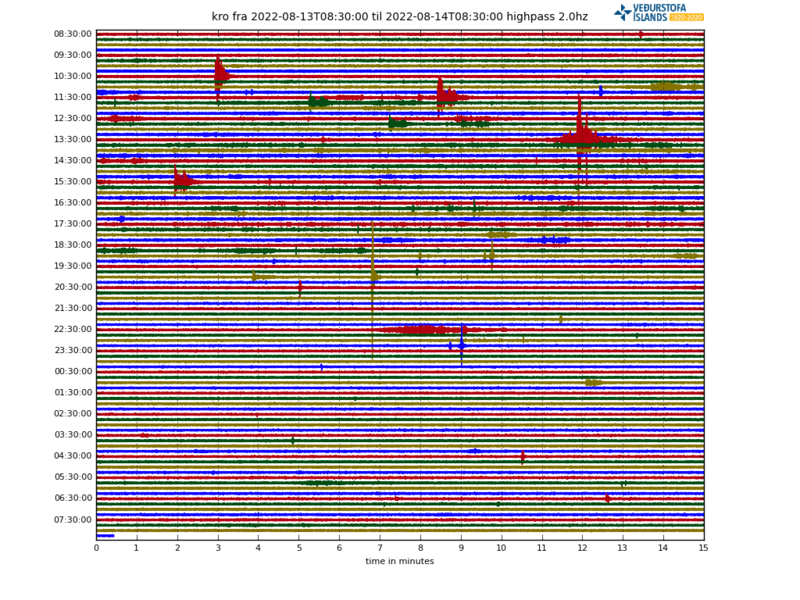 it is a good thing..
Is this something to keep an eye on a shallow 3.0mg earthquake directly on Teide Tenerife. There were some microquakes in that area, same depth, a few months ago. Those were deemed ‘non-volcanic’. This one is stronger, and seems exactly in the conduit. Probably nothing else will happen in the near future, but there seems to be some growing pressure. Hello everyone, and sorry for writing this here, but under more appropriate posts the comments were closed. Personally, I don’t have any lore to share, but this is the right place to ask. This isn’t Icelandic, but it is Nordic so may be of interest. Scary film clips and impressive action! That is scary. I read that one person died and the tsunami in the village was 3 meter high (and almost 7 meter close to where the photographer was). 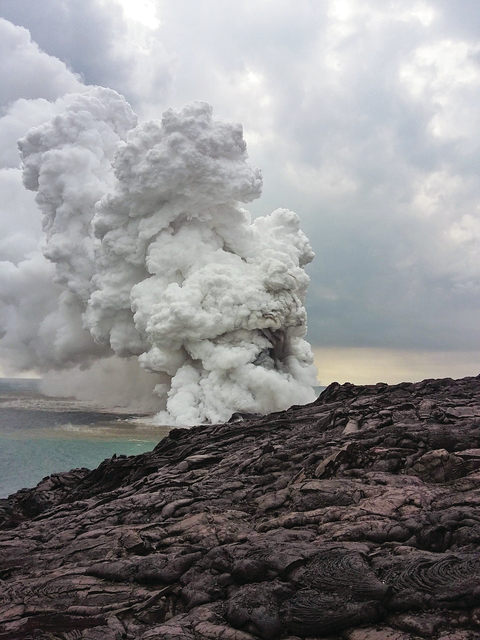 I would say that Lurking is a tremendous source for odd tidbits about volcanoes. I seem to remember everything from urinating giantesses to viking swords being covered in ash. One thing that comes to my mind is the not so well known fact that the very few deaths that has occured in Iceland in the last 50 years are all due to stupidity and not from the volcanoes themselves. During the Eldfell eruption a crafty but stupid junkie broke into the local apothecary to steel morphine and succumbed to the accumulated volcanic gasses in the basement. And there was a Tourist that got stuck in the snow as he was driving to the Eyjafjallajökull eruption and froze to death. In the end I think that the best story is the story about how Heimaey was saved during the Eldfell eruption. It is a spiffing story about human courage and ingenuity. Well worth looking into in my opinion. I forgot about the giantess thing. For any one interested, find out the back story of Thor and Gjálp. It illuminates why the fissure eruption between Grimsvotn and Bardabunga probably got that name. As for the sword, not too long ago the news was all aflutter about a viking era sword tgat had been found. The concern was getting its site excavated before the area was flooded. Turns out is that the running theory of how it got there is that an outburst flood probably escavated it from a gravesite in the first place. If I remember correctly, not too long ago in the comment chain of of of our articles, someone noted that the settings of some of the saga tales may be manifestations of volcanic activity, to not bring direct accounts of them. Items such as “land fires” that travelers had to go around to get to their destination. The Eldgja eruption is a plausible origin for the Ragnarok saga, although this is speculative as there is no direct evidence. What about the long range breccia kill that Hekla pulled off? From the way you described it, he was well away from the expected hazard area and was out tending to his business and not unnecessarily putting himself in danger. Yes, but that World record lava bomb kill was Before the 50 year limit I put in. I don’t have any lore to share, but I’d love to read the results of your project. Please let me know when you’ve completed it. I haven’t got my copy to hand to check but I think that there are some good yarns in Ari Trausti Gudmundsson’s book “Living Earth”. But you’re probably already familiar with that. is the flying sheep such a story ? Increased GPS movements North-east and up of the Skrokkalda station the last days. Placed northwest of Barda. Nothing on closeby stations. Is this a station failure, or? The KISA station would be needed here. Where on Earth did you find a GPS-link that is updated beyond the 31st of December 2016? The server has been frozen since then. Is this a sub-page link or some such? In regards of SKRO, since there are no visible signals on VONC and JOKU I would say that it is most likely something affecting the antenna, or that it is highly localized. It has also been such a short time that I would like Another week of data Before drawing any conclusions. On the same link (far down) you get GFUM (Grimsvötn) with an uplift of 60mm between may and october when it Went offline. After that there was Another 60mm on GRIM station. That is what has me rather happy. I think it has more to do with the particular magma reservoir inflating than anything else. It seems like the inflation is occuring due South of the caldera at Hábunga.Volcano. Some strong tremor signals at all tree channels for a while at GOD station but nothing on stations around. 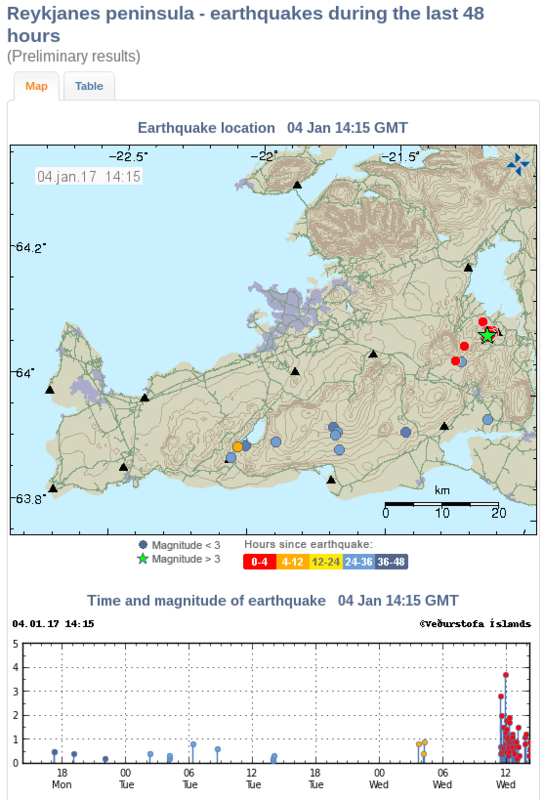 Something broken after last M3 quakes that releases a lot of water? Yes, but it is a capacitor that is faulty in the seismometer causing static noise. This is not a real signal. I would love to see the Kamchatka geyser valley, one day! How often do they erupt? I would love to go to Kamchatka, trying to sell it to #1. Also, the Kamchatka trip conflicts with our trip to see the solar eclipse on Aug. 21. Meanwhile, I wonder when they are going to get KISA going again. Closest site to biggest volcano, yada yada …. mid November is when it stopped. The signal from.GOD station at Godabunga is discontinued after a period of strong tremor at all tree channels. Was the strong signal a sign of upcoming malfunction, or was strong activity killing the station? Litle action on stations nearby. Gps station GOLA shows drifting east and some uplift the last days. Firstly, I don’t know. However, I do know electronics. It still depends on what the actual failure was, but it is entirely possible that a failing component changed the gain or reference signal of the sensor inputs before the system went belly up. That could be as simple as a resistor deciding that it would rather be a fuse. I looked on the seismogram like it was a faulty capacitor discharging wildly. In a couple of hours there will be a post up about Bárdarbunga when I have had enough of coffee to get rid of the cobwebs in my brain. ok – I’ll postpone tomorrow’s post. What is new at Bárðarbunga, or The art of tapping the Bárðarbung out of the Bárðarbunghole!